Drain has been blocked for a while. Sometimes it clears itself. Not this time. 8am. Plumber arrives. Wants to look at sewerage plan. Fair enough too. Why did I not think to have this on hand? Plan shows drains go under my rear neighbour’s property, then to a boundary trap out there. We go knock on the door and ask her to have a look. Graciously for an unexpected visit at this time of the morning, she lets us know her drains aren’t blocked, but she has heard gurgling noises, and she shows us to the back garden where the plumber needs to check where everything joins up. So… it’s gonna be a bunch of dosh for the first 90 minutes of work. And by the way, no guarantees if the blockage is so far down the pipe it can’t be reached. Her drain joins the communal pipe near the top; mine is at the bottom. 8:20am. First step is trying a jet thingy from that rear connection, up my drain to see if it unblocks anything. It doesn’t. 8:40am. Tree rooter device. Not as ancient as the last plumber. In via the gully trap in my back garden. But it won’t go down around the bend. Bugger. He tries a couple of times. No dice. 9:00am. The second plan: in via another drain which has no trap at the bottom. But this is going to involve cutting an existing pipe, and knocking away some concrete to do it. It sounds involved, and expensive. On the upside, he will leave a much improved access point for if this ever happens again… which no doubt it will. This is going to take more time, and more money — another block of time, probably taking until lunchtime. I have to think carefully about this. The last plumber didn’t need to do this. But is it a different problem this time? Who knows. Sigh. It’s hard enough these days getting time off work and arranging this kind of thing. I might as well just go ahead and do it. Now he’s cutting and chopping and making a helluva lot of noise out there. It’s doubly unfortunate that he’s working just outside Isaac’s window… and for the first time this year, Isaac is sick in bed trying to sleep. Blargh, I wonder if this was a good idea. 10:00am. Tree rooter thingy back down the new hole. 5 metres… 10… 15… 20… Ah, breakthrough! The blockage is cleared! 10:20am. Ran lots of water and flushed the toilet a few times to verify it’s draining properly. It is. Thank goodness for that. Tried to work out which tree it might be. Possibly one in the neighbour’s back yard. As the last plumber said, not much you can really do about it without digging the whole lot up, which would cost many thousands. If it’s only going to happen this bad once every 5-6 years, then hopefully it won’t take too long to resolve in future. Interestingly, the sewerage plan notes the pipe used to go direct, but was diverted so it doesn’t go under the neighbour’s house — when that house was built in the 90s. Sensible. 11:40am. After going off to get parts, he came back and replaced the pipe that had been cut away with a new inlet thingy. Looks rather good… for a pipe. Should make this saga a lot quicker/easier next time. 11:50am. All done. And the final cost? The basic callout and first 90 minutes is $385. The extra work (including parts, thankfully) was another $385. So, $770, plus GST of $77 is a whopping $847. Sigh. Here’s hoping it’s at least another 6 years before this happens again. @Jen, I’ve had that for years. A friend who worked there organised a sell-off for charity of excess signs. Of course now they’ve (mostly) been replaced with Metro ones. you should see what we’ve got “collected” in OUR backyard (not that approve mind you, but that’s the joy of living with a gunzel son). Most annoying that prices quoted are without GST. Of course, this is to make the price sound cheaper. Grrrrr. Well done on solving a problem. aaaaghh, tree roots that block drains! As I see it, the roots must be getting into the drain via a crack in the pipe, so even after the plumber clears the blockage, the weakness in the pipe remains and the root is still lurking ready to attack again. Hopefully in your case the roots will be slow growing, and will take years to cause trouble again. In our case, we were fortunately able to remove the couple of trees that we suspected may have caused the problem, but otherwise the only options appear to be become good friends with a plumber or fix the pipe by digging it up or lining it with plastic – both very expensive. My parents have major tree root problems at their place – every ~18 months the vent stack in the front yard starts to overflow after a big load of laundry, so it’s time to call in the plumber again. No need for sewage plan – they’ve come over so many times we can point out all the access holes! Got plumber out on Wednesday ourselves to have superfluous (and recently leaking) garbage disposal/insinkerator removed. It took him less than an hour, we can now use our second sink properly and there’s a bunch more room under the sink. He’s going to email through the bill. Still in denial hoping it’s not to expensive. What is that device in the picture called ? I have one of these and have no idea what it is…. @Britt …. Ridgid Kollmann Sewer & Drain Cleaning Machine with 22mm x 15ft cable. 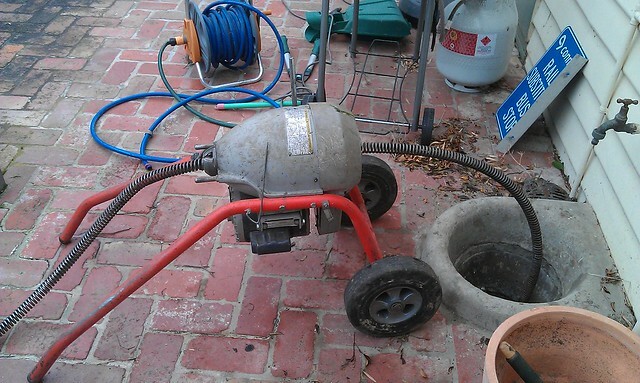 My father & I used to have this machine for 30 years and still going, sold it when he retired.